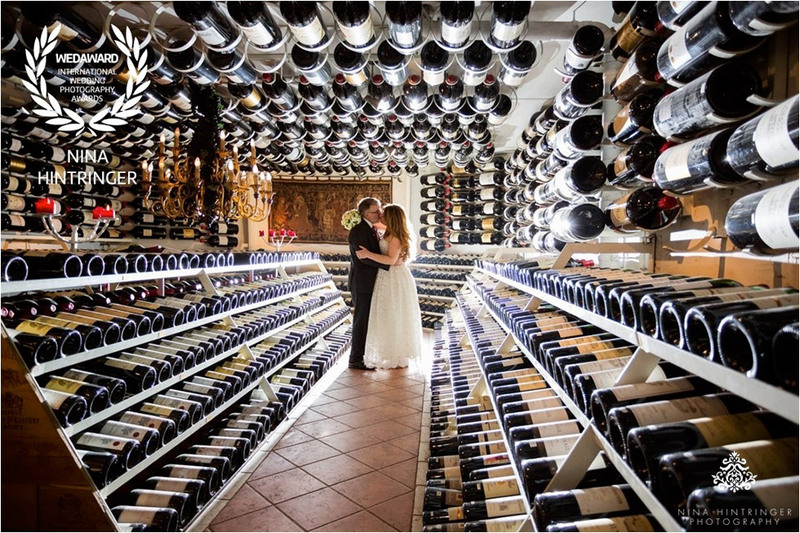 Maybe you`ve already seen on social media that we won an INTERNATIONAL WEDDING PHOTOGRAPHY AWARD with Tracey & Kelly`s wedding photo created at the spectacular wine cellar at the Arlberg Hospiz Alm in St. Christoph at the Arlberg. This wedding venue in Tyrol, Austria is really special: unique, rustic and cosy. We could not have been happier when we received the notification that we won a Wedaward, an international wedding photography contest, with one of our all time favorite wedding photos. At this point we want to thank Tracey and Kelly again, without you this photo would not have been possible and it was not just great to photograph your wedding in the Austrian mountains, we are also really happy to meet you every year since we first met for your engagement photo shoot five years ago. Wow, time really flies but we hope we can keep up doing your anniversary shoots in Austria or the United States, wherever we meet next time! Can`t wait to create lifetime memories for both of you again!